I started using VMware back in late 2006/early 2007 when I was working for a community Credit Union. I was really impressed with HA. Prior to VMware getting the same level of availability was costly and complex, HA greatly simplified this. By the time I left the Credit Union about 85% of the environment was virtualized on VMware. I saw it as a learning experience. I learned a tremendous amount about myself and my abilities through the process of designing the solution, preparing the documentation, and participating in the defense. I completed the VCAP-DCD in December 2012. I made the commitment to pursuing my VCDX in February 2013 and set a goal for defending at PEX 2014. So a little less than a year of actually preparing. I started the design I submitted in October 2013 and it was implemented in November. I had somewhere between 120 and 180 hours of preparation for the VCDX defense outside of the work that was done directly for the customer. This included preparing the design documentation, studying, and participating in mocks. Set a goal and work towards it. I think that setting the goal on defending at PEX 2014 helped me keep focus. 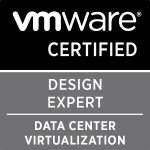 Attend the VCDX boot camp if you can, or at least watch the ProfessionalVMware.com vBrownBags on it. This will give you a lot of insight into the defense. Sign up for one of the study groups and participate in as many mocks as possible. During mocks don’t forget about the Design and Troubleshooting scenarios. Be sure to practice these also! Another piece of advice I would give is to choose a design you find interesting. The design I submitted and defended was for a 911 call center. It was a small environment but I found the availability requirements for the solution interesting. I also really enjoyed working with the customer to meet their requirements. I was very involved through the entire project, from design to implementation, and that definitely helped me defend the design. I did a bunch of them but they were all with the people I worked with. The “unfriendly” mock defense I participated in the day before my actual defense, with people that I did not know (other than the occasional tweet), was extremely beneficial. During the “unfriendly” mocks the participants dug much deeper into my design decisions than the folks that I worked with on a regular basis did. There was a lot of benefit in both the “friendly” and “unfriendly” mocks, but the “unfriendly” mock really helped to prepare me for the defense panel. Preparing for and successfully defending the VCDX was definitely worth it, especially for the learning experience. In a short period of time it has benefited both me and my company. If I had to do it all over again, I definitely would! Categories: Certifications, vBrownbag, VCDX, Virtualisation, VMware | Tags: vBrownbag, VCAP, VCDX, VCDX5, VMware | Permalink.